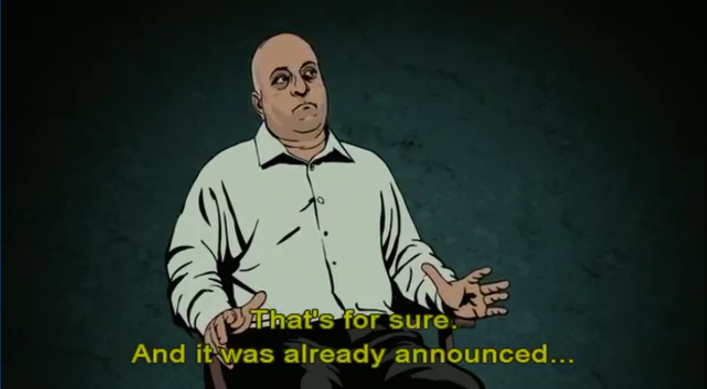 Waltz with Bashir, an animation directed by Ari Folman, depicts Ari Folman, a soldier in the Isreal defense forces and his quest, inspired by a recurring dream, to find out what had happened on the night of the Sabra and Shatile Massacre. Throughout the film, the audience sees Folman revisiting and interviewing former comrades and participants in the war. In the final 50 seconds of the film, the viewers are bombarded, thrown into the aftermath of the Sabra and Shatile Massacre by footage filmed at that time. Dream. Memory. History. 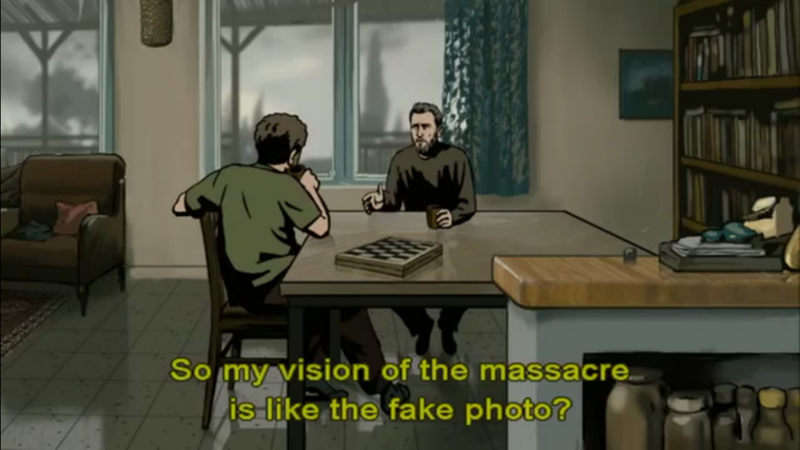 Waltz with Bashir confronts the traditional storytelling in documentaries through its use of animation throughout the film. The use of animation deconstructs the notion of reality that is normalized through stereotypical documentaries. The antagonism faced by Folman when presenting at the documentary festival, Hot Docs, in Toronto was demonstrated, when the question, ‘Why animation? Why can’t you tell this story with real people?’ was asked. Some may argue that reality for Folman is not reflected in the form of image or voice due to his choice of animation. However, it is through animation, that collective experience of Folman and his contemporaries are realized. Folman restored an experience that is collective and personal, depicting dreams, memories, and histories that can only be represented in the realm of the imaginary. In this way, the subjectivity and the obscurity of history in the genre of documentary are violently exposed. 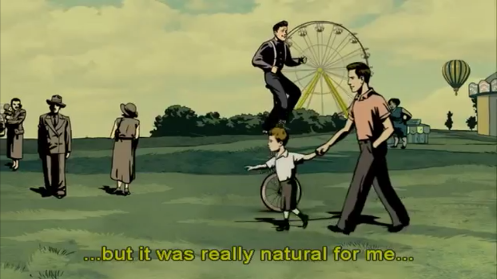 In the end, Waltz with Bashir does not resolve itself with a truth, but it invites the viewers to share and collect obscure and subjective impressions of experiences in order to form a cohesive, and linear history. Through the patchwork of collective memories, the viewers are able to experience the ‘reality’ and reconciliation of guilt personal to Ari Folman. The form of animation helped depict the experiences in a more ‘realistic’ manner as opposed to the traditional forms of documentary. Many of the arguments regarding animation’s ability to represent more accurately dreams and experiences is actually present in the film. In the scene of the Luna Park, Folman’s friend uses the example of an experiment to explain why and how memories are dynamic. The example was that a group of people were shown ten pictures of which one picture is fake; the results were that 80% of the participants believed the picture was real, and 20 % did not remember. The results of the experiment show the dynamic nature and the uncertainty of memories and dreams. It is animation that can truly reflect and portray the dynamic nature of memories and dream. Animation is dynamic, as it exists in the plane of the imaginary. It is not fixed in reality and uses drawings and not real people. It is this reason that animation not only can more accurately reflect memories, but animation also best assumes the character of memories in that both memory and animation are imaginary. Dreamscapes, like memories are also best presented through animation. Animation simulate the imaginary on a visual plane. Real objects and real people in a traditional documentary, not only depict reality, but behind the camera are ‘real’ people and object; thus it makes it more difficult to simulate the imaginary and dynamic space that the dream consists of. However, in animation, the pictures, and images are created through the imaginary and subjective mind of the artist, thus it is more ‘realistic’ in depicting scenes such as the burning of the ship and the caress of the woman, as animation holds true to the nature of dreams and memories. This is also why for Folman, the depiction of real footage is inconsequential or holds no relation to the depiction of reality. Memories and dreams are not ‘real’ and thus the depiction of it should not be ‘exact’ or grounded in ‘reality’. It is true that the characteristics of animation serve to emphasize inexact nature of the dreamscape and the memories, but one may argue that animation is not justified in its use when depicting simple interviews scenes. 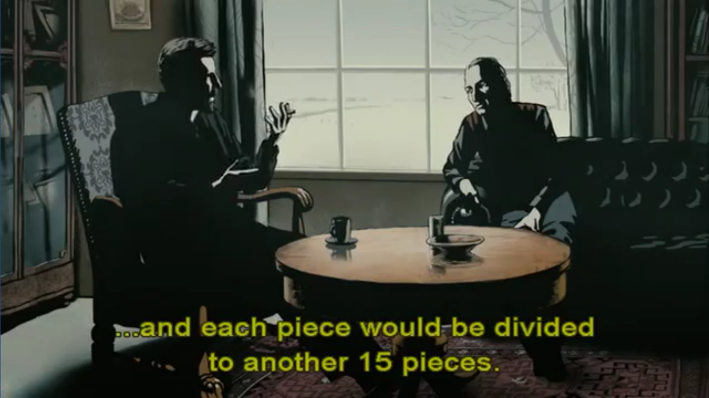 It is true that the simplistic interview scenes such as the one below are seemingly excessive if one considers why one uses animation to portray the scenes of dreamscape and memory. However, if one were to consider how Folman frames these scenes, the entire idea of interviewing still aligns with the senses of memory. The two shots are both shot in the ‘third person’ as Folman is also within the shots. 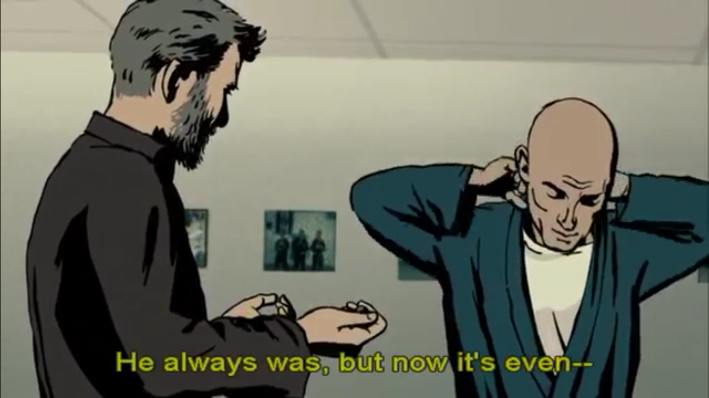 These interview scenes maybe be interpreted as memories of Folman, as he is the director as well as a character in the film. In the making of the film, these interviews actually took place, and they were transcribed. Thus, these interviews not only present itself as a memory of Folman, but it is truly reflected in the medium of animation. The scenes above like the ones in third person play a similar part in the sense that they are memories. The director, Ari Folman, interviewed them when making the film as he is in search of his truth. 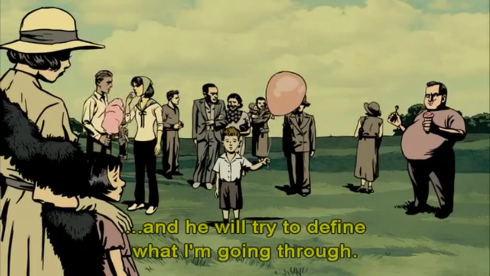 In Waltz with Bashir, structurally speaking, one experiences three types of memories: Folman’s Dreams, Folman’s memory of interviewing, and the interviewees’ memories. One is constantly reminded that the entire documentary is made of inexact recounts of their experiences through either Folman’s inability to remember certain events, or the interviewee’s unsure attitudes towards their experiences. What becomes integral in the experience of this reality is that perhaps there is no ‘truth’ in the recollection of all these various memories. 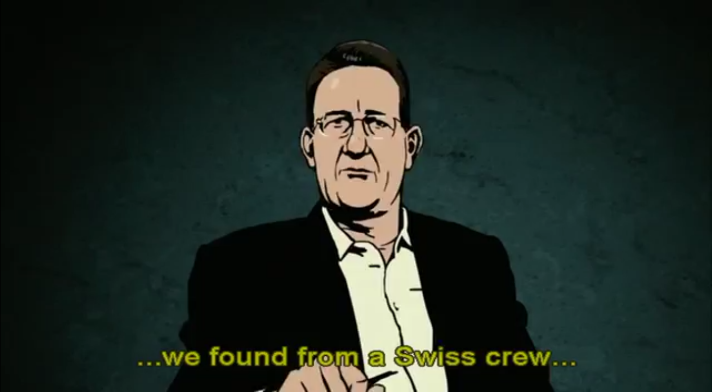 What animation provided is the escapism the Folman and his other interviewees required while emphasizing their obscure role in the massacre due to the inexact nature of the recounts. However, it is the over-bearing abrupt 50 seconds at the end that fully destroy the sense of memory or dream, or the slightest escapism that the viewers and Folman are drawn into throughout the film. 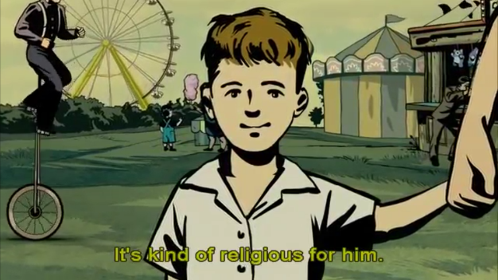 The viewers in the Waltz with Bashir experiences the reality of Folman’s search for truth, from ‘dream and memory’ that emphasizes escapism, surrealism and obscurity through animation to ‘reality’ that signified a reconciliation of violent guilt and raw truth.